Captain Jean Bodin (1530 – 1596) was a French jurist and political philosopher, economist, natural philosopher, historian, member of the Parlement of Paris and professor of Law in Toulouse. He wrote several books, including Les Six livres de la République (Six Bookes of a Commonweale, 1606), Method for the Easy Comprehension of History (Methodus ad facilem historiarum cognitionem, 1566), Colloquium of the Seven Secrets of the Sublime (Colloquium Heptaplomeres de rerum sublimium arcanis abditis, 1683), tracts on economics and the philosophy of history, and a handbook on demonology. Bodin's analyses of sovereignty influenced the development of political theory in Europe. He also introduced the idea that climate influenced the nature of a people’s national character. His elucidation of the Quantity Theory of Money, which attributed inflation in Europe to the silver pouring into Spain from Peru, and his recommendation that exports be increased in order to raise prices, were early contributions to mercantilist theory. Jean Bodin was born in Angers, France to a prosperous artisan family of Jewish origins. Bodin studied and taught Roman law at the university in Toulouse (around the time when Navarrus was there). Around 1561 he gave up teaching to concentrate on the practice of law, and returned to Paris as avocat du roi, just as the Religious Wars between Roman Catholics and Huguenots were starting. Bodin had an insatiable intellectual curiosity and read avidly. In 1566 he wrote a tract on the philosophy of history. In 1568 Bodin published a tract on economics, in which he formulated what is generally acknowledged as one of the first statements of the Quantity Theory of Money, detailing the relationship between price levels and the money supply. In 1571, Bodin entered the service of the king's brother, the Duke of Alençon (later Anjou), and accompanied him to England. In 1576-7, Bodin served as a delegate of the Third Estate in the Estates-General of Blois. Bodin threw his political lot in with Michel d'Hôpital, whose politiques faction was trying to construct a "third way" between the extremists of the Catholic Holy League and the Calvinist Union. Bodin urged negotiation with the Calvinists rather than resumption of the religious wars, and he opposed the sale of the monarchy's lands to raise funds for any such endeavor. During the height of his active political involvement Bodin composed his celebrated Six Books (1576), expounding his famous theory of sovereignty, which was in many ways consistent with the political positions he had taken at the Estates-General. In 1580, he wrote a demonology "handbook" for judges at witchcraft trials. Bodin badly misjudged the fanatical spirit of the time. The religious wars were stepped up and the politiques, Bodin included, fell out of royal favor. In the political whirlwind which followed, Bodin was accused of atheism. When the Duke d'Alençon died in 1583, Bodin retired to Laon as procurateur to the presidial court. In 1588, after Catholic troops captured the town, Bodin prudently switched his allegiance to the Holy League. He welcomed the ascendancy of Henry IV and the restoration of the politiques in 1594, but, as he was now officially allied with the fanatics, Bodin was not asked to return. He died in Laon in 1596 of the plague. Jean Bodin was a natural philosopher, historian, professor of law and an economist whose theories were precursors of mercantilism. He wrote during the Reformation, against the background of religious and civil conflict, particularly the conflict in his native France between the (Calvinist) Huguenots and the state-supported Catholic Church. He was the author of several books, most of which were condemned by the Inquisition for the author's apparent sympathy with Calvinist theories. Little is known about many aspects of his life, and his thought and political positions have often been misunderstood by historians, whose mistaken interpretations were then attributed to Bodin himself. 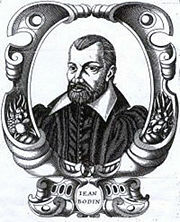 Jean Bodin’s most famous work was Six Books of the Commonwealth (or Les Six livres de la République, 1576), which won him immediate fame and remained influential among western European intellectuals through the seventeenth century. It encompassed the legal and political thought of the French Renaissance. Bodin's “theory of sovereignty” gave significant influence on political thoughts. Method for the Easy Comprehension of History (Methodus ad facilem historiarum cognitionem, 1566) consummated early-modern, European humanism's philosophy of history. Colloquium of the Seven about Secrets of the Sublime (Colloquium Heptaplomeres de rerum sublimium arcanis abditis, 1683), published posthumously, provided clues about his own religious views, a kind of rational spiritualism. Bodin's spiritual beliefs did not coincide with any official religion of his day, but instead resembled a form of natural religion. Les Six livres de la République (Six Bookes of a Commonweale, 1606) appeared in 1576. Bodin’s ideas on the importance of climate in the shaping of a people's character were quite influential, finding a prominent place in the work of contemporary Italian thinker Giovanni Botero (1544-1617) and later in French philosopher the Baron de Montesquieu's (1689-1755) "climatic determinism." Having experienced the bitterness of the civil war in France and the anarchy which followed, Bodin was concerned with the problem of how to secure order and authority in a state. He believed that this could be achieved through recognizing the sovereignty of the state as the supreme power. This power was unique and absolute; no limitations of time or competence could be placed on it, and it did not depend on the consent of its subjects. Bodin assumed that government was put into place by providence to ensure the well-being of humanity, and therefore commanded the people by divine right. Government consisted essentially of the power to command citizens, through the making of laws. In a well-ordered state, this power would be exercised according to principles of divine and natural law, such as the Ten Commandments and certain fundamental natural rights of man. If a government failed to follow these principles, however, the sovereign was still in command and could not be resisted by its subjects, whose duty was to be obedient to their ruler. Bodin distinguished three types of political systems: monarchy, with the power resting in one person; aristocracy, with the power vested in an elite minority; and democracy, with the power vested in a majority. Bodin favored a monarchy, advised and informed of the needs of the people by a parliament. Jean Bodin’s definition of the sovereign, as a ruler beyond human law and subject only to divine or natural law, established the characteristics of the divine right of kings. Sovereignty was absolute, and indivisible, but it exercised itself only in the public sphere, not in the private. Sovereignty did not expire with the death of the person who held it, it was not the property of any individual. This concept of sovereignty reappeared in various forms throughout the development of political theory. Social contract theories, such as Rousseau’s (1712 -1778) definition of popular sovereignty, which makes the people the legitimate sovereign. Machiavelli, Hobbes, Locke and Montesquieu also developed the concept of sovereignty in their theories. Modern thinkers such as Carl Schmitt (1888-1985), who defined sovereignty as "the power to decide the state of exception;" Georges Bataille, who introduced a heterodox conception of an "anti-sovereignty;” Jacques Derrida, Agamben and Jean-Luc Nancy developed new applications of the concept in response to modern political developments. In France, Bodin was most noted as a historian for Method for the Easy Understanding of History. He wrote, "Of history, that is, the true narration of things, there are three kinds: human, natural and divine." As a historic politician, Bodin contributed to the restoration of France as a strong nation-state. Bodin’s interest in economics was sparked by the writings of Malestroict, who promoted the standard argument that the inflation raging through Europe at the time was due to debasement of currency and clipping. In his 1568 tract, Bodin did not disagree that these activities could cause inflation, but blamed the inflation on the Peruvian silver pouring into Europe through Spain. Bodin noticed that clipping, debasement and imports of silver all increased the amount of money relative to goods available in the market. Consequently, Bodin formulated what is generally acknowledged as one of the first statements of the "Quantity theory of money," detailing the relationship between price levels and the money supply. Bodin recognized that money flows in the opposite direction of goods, and that exports of goods increased prices, while imports lowered them. The mercantilist formula for foreign trade was already implicit in Bodin's recommendation that in order to raise prices it was necessary to run a favorable balance of trade. Bodin himself generally advocated free trade, believing it stabilized prices, helped bring nations together and promoted peace. Bodin also articulated a plan for a government-run commodity buffer stock scheme to stabilize wheat prices, and an international agreement for monetary standards. He was completely opposed to the lifting of the ban on usury. In his demonology "handbook" (1580) for judges at witchcraft trials, Bodin recommended torture, even in cases of the disabled and children, as a way of confirming guilt of witchcraft. He asserted that not even one witch could be erroneously condemned if the correct procedures were followed, suspicion being enough to torment the accused because rumors concerning witches were almost always true. All links retrieved My 1, 2018.